A deal made over the Doctor Who Experience run by BBC Worldwide has left Cardiff council taxpayers with a shortfall of £1.147m. The council paid to construct the building and planned to recoup the cost through a share of ticket sales during the centre's five-year lease. The building in Cardiff Bay has been empty since the exhibition centre closed last September. The council said it was working on alternative plans for the centre. BBC Worldwide is the commercial arm of the BBC, responsible for promoting the brand across the world and creating a global audience. It is understood the land, which is owned by the Welsh Government, was leased to Cardiff council. In 2011 the council agreed with BBC Worldwide to provide accommodation for the Doctor Who Experience on the Cardiff Bay site and spent more than £2m on construction. The 3,000 sq ft (280 sq m) centre was then let to BBC Worldwide and opened in July 2012. Part of the deal meant the council was to receive a share of ticket sales so that it could recoup the building costs up to £2.4m. The attraction - which housed Daleks, Cybermen, and a Tardis simulator - closed in September after its five-year lease expired. Councillor Russell Goodway, Cardiff's cabinet member for investment and development, said "In 2011 when the deal was done to subsidise the Dr Who attraction in order to bring it to Cardiff, the then-administration worked on the basis of ambitious projections for visitor numbers. "Unfortunately the projected visitor numbers failed to materialise leaving the shortfall which should have been made up in ticket sales." Mr Goodway added: "This has left the council having to make up the £1.1m which will have to be absorbed by the council's budget. We are, however, working on plans for the building with the Welsh Government although nothing has yet been finalised." 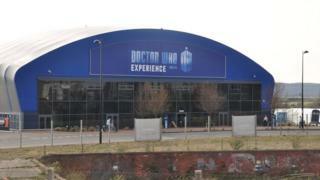 A spokeswoman for BBC Worldwide said: "The Doctor Who Experience was enjoyed by fans for five years in Cardiff Bay during its lease with Cardiff Council. "The lease ran for its full, five year term and there was no additional loan agreement. We cannot comment on Cardiff Council's own business plan in relation to the site." Cardiff Conservative councillor Adrian Robson, said: "I still don't know how we managed to lose over a million pounds on Doctor Who. "Somewhere the council and [BBC Worldwide] have not got their projections right for visitor numbers. It's very strange because this is a global brand."